Years ago, after several miscarriages, I became pregnant again. The whole pregnancy was riddled with doubt. Would the baby go full term? I felt that the first words I said to my offspring—if there was an offspring—should be special. I decided I would sing a Judy Collins song. My debut was meant to be my last public performance. Twelve years later, my daughter had scoliosis surgery. It involved deflating one lung, spreading her ribs, inserting screws into her spine, seeding the vertebrae with cadaver chips, and joining it all with a titanium rod. When it was over, she needed a morphine drip for the pain. At one point, her IV needle fell out and needed to be reinserted. A pediatric surgeon was called in, since no one else could find a vein. My daughter squirmed in agony, waiting for her much needed pain-dulling meds. The surgeon’s first three attempts failed. The doctor moved to another location and my daughter cried out, “Will someone sing?” Music had always been a source of solace for her. Finally, I could be something besides a useless bystander. I’m not sure if the rest of the pediatric ICU appreciated it, but I sang. A vein was a found. Sleep followed. The healing began. 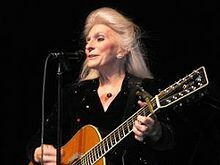 Thank you, Judy Collins, for that beautiful song. It’s been with me for the most important moments of my life. Don’t worry though, I won’t be competing with you for concert venues. I only sing in hospitals.